s and why people living there find it difficult to move out of absolute poverty.
. If the crops cannot be harvested, the country cannot earn money from trade with foreign countries. countries and is also one of the world's poorest countries. It suffers severe flooding every year. Some farmers in LEDCs do not receive a fair price for the goods they produce, eg coffee. 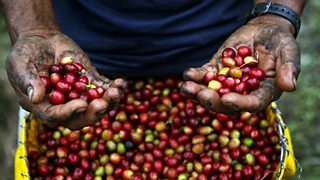 If something happens to the crop because of poor weather, the profits of the retailer do not suffer as the price we pay for coffee can increase, but the farmer's profits do not. The farmer receives a small cut of the price it is sold for in the UK because the price also covers harvesting, exporting, shipping and retailing. , it means that the farmer receives a fairer price for the crops and a Fair Trade premium is put back into their farms and communities to help future development. s to fund development projects, eg building roads and schools, the interest is often unaffordable and yet it continues to increase. These large debts prevent LEDCs from helping their own people. At the start of 2013, around £2.34 billion was owed to the UK by 24 nations, £825 million of which is interest. Sudan, for example, owes the UK £681 million, of which £508 million is interest. War increases the problems of debt for poor countries, eg when Eritrea was involved in a war with Ethiopia, between 1998 and 2000, 70,000 people died. The money funding weapons chould have been spent on food production. If people who usually work as farmers are fighting wars, they cannot grow and harvest food. Some of the aid given to LEDCs has never reached the poor. In some cases it has been used to fund a war. reports that in Sub-Saharan Africa, approximately one in three adults cannot read and 32 million primary school aged children are not in school. argue that in poor countries, only education will enable people to help themselves out of poverty.